Water Quality: In 2016, there were no impaired streams or proposed impaired streams in the Mt. Hope Cemetery subwatershed. 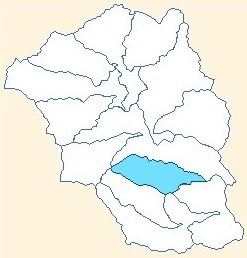 The Sugar River runs near the northeastern border of the subwatershed. State Line Road divides the basin between Illinois and Wisconsin. The namesake of the subwatershed, Mt. 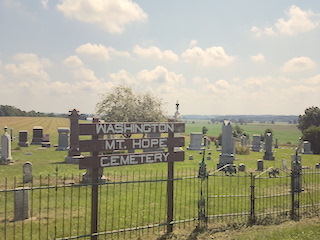 Hope Cemetery (also known as Washington Cemetery), is an old, country cemetery in Spring Grove Township, Green County, on Mount Hope Rd. near the intersection with Rock Hill Rd. A number of points in this subwatershed have had Watershed Rapid Assessment Survey (WRAS) sampling done by LSRWA over the past several years. According to 2011 data, the average sample scores fall in the medium range of 54-67. This score is designed to give an initial estimate to help people determine if there may be specific conservation concerns within a given subwatershed. In 2016, there were no impaired streams or proposed impaired streams in the Mt. Hope Cemetery subwatershed. The impaired waters list is published every two years by the Wisconsin Department of Natural Resources, to show which bodies of water do not meet water quality standards, as established by the Clean Water Act. The Natural Resources Conservation Service produced a Rapid Watershed Report of the Sugar River in 2008. While this does not include the survey data, it provides a valuable look at the watershed. History buffs may enjoy perusing the 1884 History of Green County, which provides online excerpts from a history, written in 1884, focusing on chapter XLI, Spring Grove Township. Descriptions of the land, farm crops, local businesses, prominent citizens, and recollections of the “early days” by one J. W. Kildow are all included. The Town of Spring Grove Comprehensive Plan also contains a brief history of the settlement of the area. A very small portion of the Avon Bottoms State Natural Area is west of the Sugar River, along the Wisconsin/Illinois border and is in the Mt. Hope Cemetery subwatershed. Avon Bottoms is a lowland hardwood forest in the floodplain of the Sugar River. The mature tree canopy and understory of common and rare herbaceous and woody plants provide rich floristic diversity and habitat for hundreds of faunal species, including mammals, birds, and insects. Oxbow lakes provide critical habitat for fishes, amphibians, reptiles and invertebrates. Avon Bottoms is a popular bird watching location, however, most of this activity probably takes place on the east side of the river, where the majority of this natural area is located and is more accessible by road. In 2014, the 714 acre H & L Farms Wildlife Management Area was added to the Avon Bottoms Natural Area. Located in the sandy floodplain of the Sugar River, it features sprawling areas of restored grasslands and wetlands that provide habitat for a variety of wildlife, including pheasants, quail, cranes, ducks, shorebirds and songbirds. The long term goal is to turn the land over to the state for ongoing management. Until then, the area is managed by Pheasants Forever and is open to public hunting and outdoor recreation. 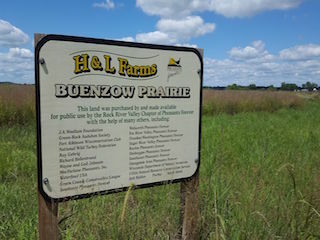 A sign at the corner of South Hopkins and West Douglas roads identifies the area as H & L Farms, Buenzow Prairie. Brian Buenzow, a retired WI Department of Natural Resources wildlife biologist, was instrumental in establishing the Avon Bottoms Wildlife Area. Such drainage systems result in the loss of natural wetlands, which are an important asset in maintaining water resources. Wetlands play a significant role in managing stormwater and flood control; they filter pollutants, recharge groundwater, and provide habitat for many plants and animals. Wisconsin lost almost half of its wetlands after European settlers came to the area, according to the Wisconsin Wetland Inventory, completed in 1985. The agricultural practice - of draining wetlands was very common in the decades of the 1950s, 60s and 70s. In the 80s and 90s, wetland loss due to agriculture decreased by more than 90 percent, as there was more awareness of the value of wetlands and some federal programs encouraged wetland conservation (Town of Spring Grove, 2005). Protection of natural areas, including wetlands, wildlife habitats, lakes, woodlands, open spaces and groundwater resources. Protection of economically productive areas, including farmland and forests. For a printable PDF map of Mount Hope Cemetery Subwatershed click here. Jenson, T. (2016, January 19). [Telephone interview]. Todd cited the book "Surface Water Resources of Green County," 1980.